Hey everyone. Jason Lee here. In this video we're going to talk about how to promote Clickfunnels. The first thing I'm going to teach you is how to promote Clickfunnels using either a blog or a website. It's pretty, pretty self-explanatory, but I'm going to walk you through basically what you're experiencing right now watching this video and reading this post. First what you're going to want to do if you're a blogger is you're going to want to come over to Google and use their autosuggest tool. By autosuggest, what I mean is when you type in the word clickfunnels in Google here and you hit space, it's going to give you a list of words. You can start by typing in each letter A, B, C, D, and then choosing for example, clickfunnels review, choosing a phrase and working from there. Keep in mind that you're going to want to think about what are the niches, what are the businesses, who are the people who are going to need or want this service the most? It's best to go after those targets. I like to personally go after low hanging fruit first, so if I can find a niche that's really hungry for this service, I'm going to look for keywords and keyword phrases that I think that niche is going to be looking up online. So for example, clickfunnels review. If I hit enter after typing in clickfunnels review in the autosuggest feature of Google, I'll get a list of searches. Here at the top you'll find the very top performing articles, so if you want to write a post using this keyword phrase, you can go into this article and see what it is that they did in their post to hit the top post in Google which gets the most traffic. This number one position post here on Google for click funnels review is going to get about 66% of the traffic on this entire page. That's why the number one spot is so powerful. Down at the bottom you're going to see a category called searches related to the phrase you entered. So for this particular phrase we entered, its clickfunnels review, we're going to see a list of keyword phrases. These are good keyword phrases to use in your blog post as hyperlinks or anchor text. I like to create anchor text using these related phrases down here and either link to other pages on my site if I talk about those things or link off the site to uncompetitive pages like Wikipedia and things like that in order to help Google better understand that my page is relevant for this search phrase, click funnels reviews in particular. So, that's how to get started. When you begin to deep dive after you've clicked one of theses for example, like click funnels pricing, I can come down again and at the bottom I'm going to get searches related to that term. You're going to want to continue doing this until you find phrases that you believe are going to be good for you to go after based on your niche and your area of expertise. That's ultimately how we came to find this phrase, how to promote clickfunnels. There's two types of people who are going to be clicking on this link on the homepage here. So, when you scroll down the homepage there's 10 results. There's going to be basically two types of people that are going to be clicking on these links. There are going to be people that are either already involved in clickfunnels and so they're trying to figure out how to make money with the affiliate program that clickfunnels has, which offers a 40% commission. We'll go into the back office into the dashboard and I'll show you what that looks like here shortly, and then there's going to be people who have not yet purchased clickfunnels or tried the 14 day free trial or signed up with the membership. Those people are trying to figure out how do I promote this platform, so they might be affiliate marketers, and how do I make money with this platform before they pull the trigger on it so that they can actually have the service paid for and get off to the races really quick by promoting it when they sign up. I would imagine it's a small percentage, 10 to 20%, but hey, that's the low hanging fruit we're after. So if you're one of those types of people who has not yet purchased click funnels and you're here looking on how to promote it, congratulations, you are exactly the type of person that I was attempting to target in this article. We're walking through right now exactly how we do this personally using blogging. We're going to get into some other methods as well. We'll talk about those, but right now we're focused on blogging and I'm showing you with keyword research how we do that. So the next thing you're going to do if you're a blogger is you're going to come down here to the number one article. I like to look at the title, How to Promote ClickFunnels. He just uses the phrase and it looks like he uses a pipe bar and then kind of gives another explanation of what that means. Not a bad title. You look at the meta description, see how he or she posted that and they include the keyword phrase in the meta description, which is good. When you go to the post and you open up the post, I like to look at the images and the media and the titles and the headlines and see exactly what that looks like. See what I'm dealing with. The word count, I also like to look at that. How in-depth is this article? Right away you can see the media, the images are really good. The titles are keyword-rich and basically they've structured this into four sections, how to promote clickfunnels using this platform, YouTube, how to promote clickfunnels through blog or website, how to promote clickfunnels with social media, how to promote clickfunnels to businesses. Then I like to look at their anchor text and their hyperlinks. Notice here there's one that says clickfunnels is a helpful tool. Well, when I open that up where does it go? It goes to another page on their website that's related to clickfunnels as well, which tells me they're definitely an affiliate. Then they have other it looks like affiliate links here for programs like Screen Cast-O-Matic and other platforms that they use to promote those and make affiliate commissions from those as well. But it's not a long article, maybe 1,000 words. The images are very good in this post for click funnels, how to promote clickfunnels, but I do not see a video. I do not see any audio, so it's not rich in media. It's not long. It's not complicated. It's not overly in-depth and I think I stand a very good chance through this post over the next two weeks ranking in the top spot and one-upping this article in very short order with this post. We'll see and if you want to check back on it in a couple of weeks and see how it's ranking, you'll be able to see whether or not we were able to do that. Each platform is its own search engine. YouTube is its own search engine, Google is its own search engine. You can get traffic in either place regardless of what medium you're using to convey the message. But that's how you use your blog or your website to promote clickfunnels. Obviously you're going to need an affiliate link, so let's run into the clickfunnels dashboard and show you what that looks like. So on clickfunnels when you first get signed up under the account tab you're going to see a link down here at the bottom of the drop down title Affiliates. That's where you can sign up to become a clickfunnels affiliate. Once you do you'll have a dashboard. I was never really promoting clickfunnels that hard. I decided about seven days ago to start pushing it with blog posts and seeing what we can do. It actually worked out pretty good. You can see here over the, I mean we've only made like 2,700 bucks lifetime earnings, probably over the last year so we haven't pushed it hard, but look, over the last seven days we made like 350 bucks. Over the last 30 days we made 400 bucks. Every month it's a membership-based platform so every month this amount or more is going to come in based on how many more people we put into the program. 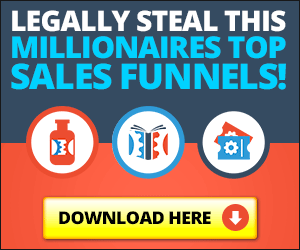 Clickfunnels is an incredible program. Russell Brunson's done an amazing job with the platform. He knows his stuff better than anybody. He's toured the world with Dane Kennedy, he spoke from the stage. He's an excellent copywriter. The guy is a phenom. We interviewed him on our podcast. He has no intentions of ever selling this company or going anywhere, so I'm confident as far as third-party tools go that it's going to be around for a long, long time. On this page, their affiliate dashboard, I personally believe that they could clean this up a little bit because it's kind of busy. It almost looks like it was built by someone who was very techy and didn't get much input from somebody who was not, who was more of a designer. They could clean it up a little bit, but if you look down here below, you're going to see these blue buttons. This is where you would go to get all of your affiliate links. You click on them, it will open up in a new tab, which is a nice feature so you don't have to click the back button. Then here on this page, which is also kind of really busy and messy, not a big deal though, you're going to find all your affiliate tools. So as you scroll down you're going to see all the different things you can promote. So the 14 day, the free 14 day trial package for click funnels is found about a quarter of the way down on this affiliate center page for clickfunnels. So in this blog post and in this video, in the description in the YouTube video, you're going to see hyperlinks. This affiliate link of mine is what's going to be attached to those hyperlinks, which gives me credit if you decide to take the trial and stick with the program. By the way, if you do decide just as a, in terms of full transparency, if you do decide to take this thing for a test spin, our company is actually building free sales funnels for people who sign up using our hyperlink, our affiliate link, so we'll build you, we're look at your business, if you're a small business owner, if you're an entrepreneur and we'll create you a short minimum two-step sales funnel. We'll link up your autoresponder with it if you don't know how to do that and we'll get you started off right away with a free funnel, which typically costs anywhere from $1,500 in up to it could be thousands of dollars to have someone build you a sales funnel with copywriting and all that. We'll do that for you for free. So using your graphics, using your video, we're not going to create video for you or create graphics for you, but we'll do the copywriting, which is expensive in and of itself. You're going to see this affiliate link in this post, in this video and all the affiliate tools including banners if you do any banner advertising, and even email swipe. So swipe is just copywriting where you can copy email they've already built for you and promote to your email list if you already have one. So Russell went way overboard in terms of providing you the tools you need to succeed as an affiliate inside clickfunnels. Very, very easy to do. It just takes some work. Yes, anybody can do it. I have no doubt that you can do it if you're here, especially if you're a blogger and we're a little more active than most affiliates in terms of support with the people who sign up through us, so if you need some help you can reach out to me on Facebook. My handle is JasonLeeHQ like headquarters. More than happy to get you pointed in the right direction. That makes it really easy to get support. Then from the dashboard there's a little Get Help icon on the bottom right where you can ask questions and they typically respond with live chat. This turns into a live chat after you submit your question and they'll respond within an hour and you can engage in a live chat message box with them right here inside the dashboard. They're very responsive. Customer service is great. I highly recommend it. So that's how to promote click funnels using a blog or a website. Now, if you want to do it some other way, so we talked about search engines and optimization in YouTube, how to promote click funnels using YouTube. We didn't really go into that in detail, but it's the same concept. So if you were to promote click funnels using YouTube, I would come over here and I would say how to promote click funnels. What we like to do personally is we record our video and then we have a content marketing team that takes the video, uploads it to a platform like Rev.com, turns it into text and then just like Moz does, if you follow SEO Moz, they submit, they take that text, they tweak it to make it readable and then they turn that into the content underneath the video on their blog post. We like to do the same thing, then you don't have to reinvent the wheel. You don't have to make up new writing. You don't have to hire content writers. You just cut a video, you pay about a dollar per minute to have it transcribed into text and then you make that your blog post. It's a very, very slick strategy. I highly recommend it if you're a blogger. But what I do like to do is I like to look right here at the headline, how did he structure his YouTube headline? Then I like to look at the description. So what does he write in the description? Notice it's not that long. Look, I'm going to share with you how I made money with clickfunnels, how I promoted it. He uses keywords like Russell Brunson, clickfunnels affiliate program, clickfunnels training, free clickfunnels training. So he's really sharp in terms of keyword research and what he needs to put in here because he's using all the right words and phrases to get this thing ranked. Those are the things that I'm going to pay attention to and I'm going to include things like that in my YouTube description to make sure my YouTube video stands a chance. The same YouTube video that's going to go on my blog post by the way, stands a chance of outranking his here on YouTube. Then he hyperlinks at the bottom like he should to a related YouTube video on his channel and to his blog right here. He's doing the right things. Obviously he ranked number one. He's already got 6,000 views. For whatever reason though people aren't really, it doesn't look like unless he just got started, as of August 8, Tuesday August 8th. It's August 7th, so he ain't doing too bad, right? what kind of headlines are being done. This is a good image too. He did good with his image. Why try to figure out how to craft the perfect content? It's there for you. They've already told you. YouTube's told you. Here it is. Here's what we think the perfect content looks like on YouTube to rank number one for the phrase how to promote clickfunnels. Boom, you got it so just duplicate that. Do more, do it better and you should do fine promoting clickfunnels on YouTube. Another way you can promote clickfunnels obviously is through social media. If you have a Facebook account or if you have Instagram or if you have Twitter or if you have LinkedIn or Google Plus, you can go over to Google Communities, you can share your blog content there. You can go to LinkedIn Groups that are related to the content that you're going to share and post your blog article link there. Don't ever post your affiliate link in Google Communities or LinkedIn Groups or Facebook Groups. You'll get banned, but you can post your blog URL that teaches people how to promote clickfunnels. Even though your affiliate link's in that post, it's not a direct pitch to those groups so it's delivering value to them first and oh, by the way, here's our affiliate link. So you can use Facebook Groups to do that. You can use LinkedIn Groups to do that. You can use Twitter to do that and Google Plus Communities to do that. There's a number of ways to do that where there's plenty of people hanging out in related groups, crowds, audiences that want to know how to promote clickfunnels. That's where you begin your social media syndication or your social media marketing campaign promoting click funnels, but it's after the content is created, so I would not have my team go and do that until after my video's uploaded on YouTube, after my blog post is active and live and after I've fetched and crawled using Google Webmaster Tools so Google indexes it and knows to begin ranking it appropriately. Once all that stuff is in place and it's ready to go, then I'll start having my team go out to these different social media platforms logged in on my account and promoting the content like they need to promote it. So that's how you can use social media to promote click funnels. It's very easy, very simple, very straightforward. Email marketing is a great way to promote click funnels, especially if you already have a list. So if you already have a list, I would simply use, we talked about it a minute ago, the swipe files inside the affiliate dashboard that Russell Brunson has already come up with and you just click. Again, you click the affiliate tools, get my links button from your affiliate dashboard and clickfunnels and you'll scroll down. Near the bottom you're going to find all the swipe email files for promoting clickfunnels. You would just in your subject line whether you use AWeber or MailChimp, whatever you might use, Constant Contact, you just copy the subject line and then you copy the body, put it in the body and then you schedule an email broadcast out to your email list. Make sure you include your affiliate link. It's going to tell you in here add your link, where you need to add your link for the different affiliate links, things that you could sell through clickfunnels. Keep in mind clickfunnels, once you're involved has more to sell than just the clickfunnels membership. Even though that's my favorite thing to sell because it's an ongoing commission, but they sell other things. They sell the Dream Car Program, they sell the Affiliate Bootcamp, they sell a university membership so you can enroll in an online school. There's a lot of different programs. These books that Russell has written, they're great books. They're part of funnels that he's already built. You just promote the book and then the funnel walks the buyer through the buying process on all the upsells and you get paid out 40% on that. Look, there's a Funnel University monthly membership. You can promote that. There is a Funnel Scripts product, you can promote that. There is Funnel Catcher, Funnel University. Then he's got the Perfect Webinar Secrets. There's all these programs that you can promote inside click funnels that will make you money and the commissions ar really good, 40% ain't too bad. That's how you can promote it using your email list. The swipe files are there for you. You don't have to reinvent the wheel. If you're a good copywriter, by all means write your own copy, write your own email, but it's there for you if you need it. So we've covered blogging, we've covered websites, we've covered YouTube marketing. We've covered social media, Facebook, Instagram, LinkedIn, Twitter, Google Plus Communities and we've covered email marketing. The other way, one of my other favorite ways of doing this, which may or may not apply to you is if you run a marketing company or a marketing agency and you have small businesses or medium size businesses you service, you can go to those people and you can offer them something free in terms of like a bonus or an eBook or a video course or something. That way you can actually go after small businesses in your local area. If you have Chamber of Commerce, a BNI Group, whatever it might be in your local area, I highly recommend you sign up. Meet all the business owners in your local community and begin offering them a free service that goes a long with this membership. It's very easy inside clickfunnels to build a funnel. It's like point and click, you know? Then by the way, once you do it once, you can share that funnel with your main account and share that funnel with new people that you bring on board in the business world. Small businesses are great clients to go after. They make great affiliates as well sometimes. So that is another way offline that you could promote click funnels is to small businesses in your local area. Powerful, powerful way to earn some money through Russell Brunson's program. Hopefully you found value in this click funnels How to Promote ClickFunnels article and this How to Promote ClickFunnels video. Again, in full transparency the affiliate links here will give us credit if you decide to sign up, but we will build you a free sales funnel inside this platform and we will help you, coach you a little bit if you need it. If you enjoyed this Clickfunnels article, make sure you check out Clickfunnels vs Optimizepress. It'll help you decide which is better should you be in a toss up over using them. Another good read is: How to Crush It Using Clickfunnels for MLM.